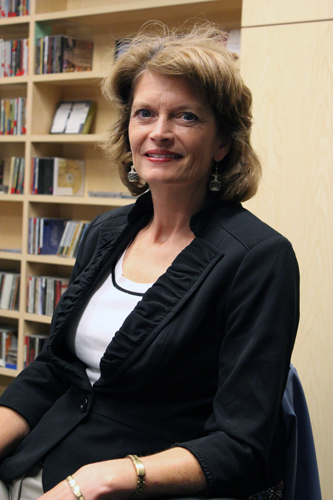 Photo by Josh Edge, APRN - Anchorage: Senator Lisa Murkowski in the APRN studios for Talk of Alaska on August 23, 2011. Jane Lubchenco interrupted the meeting in Anchorage this morning to announce there had been an earthquake in Washington DC. The 5.8 magnitude earthquake was an unusually large one to strike the DC area and the capitol building was evacuated. APRN’s Libby Casey was in her office in the capitol at the time, preparing to go on the air with Talk of Alaska. She says at first she didn’t realize it was an earthquake. Senator Murkowski fielded a wide range of questions from Alaskans during Talk of Alaska. She says replacing Arne Fuglvog, her former fisheries policy advisor who has entered into a plea agreement for falsifying fishing records, is a priority because of the wide range of issues his job entailed for her office. “Arne was not only responsible for fish he also handled a broader portfolio that involved everything from the arctic to transportation, I’ve worked in the office to fill those holes, but finding the right person for fish policy will be key,” Murkowski said. She says she is looking for suggestions for the position. A caller from Palmer concerned over the national debt wanted to know why taxing the rich is opposed by Republicans. Murkowski said she thinks raising taxes now is a bad idea but she’d like to see an overhaul of the entire tax regime to close loopholes and create a more equitable system. She says however that taking taxes off the table completely is not reasonable. In response to a question about how to create jobs, she suggested reducing regulations on business would help. “The cost to businesses, whether it is, how you now have to track your emissions, regulations as they relate to the FCC,regulations as they come out as they relate to the FDA, all of a sudden the cost to businesses to do business here, to hire people in this country, it’s overwhelming,” Murkowski said. Murkowski said she realizes the halibut catch share plan is controversial but she says the numbers of fish needed for larger shares are not there and overfishing must be guarded against. She says both the commercial and charter fleets have seen reductions and both sides feel they’re giving up more than they should. Senator Murkowski said she hopes Congress will get more done in September, citing the fact that only one appropriations bill out of 12 has been dealt with. She said continuing resolutions for funding is not good government.